If you’ve never experienced a Lagree Fitness workout, you probably have a lot of questions. You may have glimpsed the Megaformer and thought to yourself, “what the heck is that? !” While you may be intimidated when you see what appears to be a Pilates machine on steroids, the Megaformer is what you have been missing from your life to take your workout to the next level. If you’re curious to try this 40-minute class, sign up for your first class at Inspire Seattle today! In the meantime, here is what you can expect when you come in for your first workout. 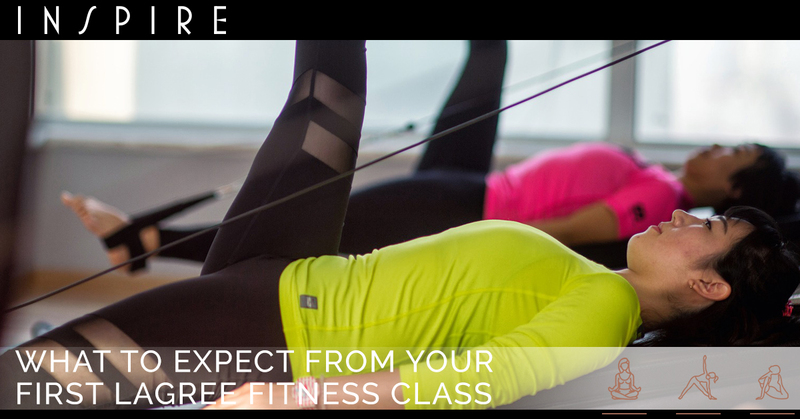 Each class is 40 minutes long, but plan on arriving for your first class about 10 minutes before it starts. This way, you can talk to the instructor and get a high-level introduction to the Megaformer. As far as what you should wear, keep in mind that you will be working on fitness machines, so you don’t want any loose clothing hanging down that could get caught. We recommend leggings and a fitted tank top or t-shirt. In addition, you will be doing the workout either barefoot or with grippy socks. Keep in mind that you will not be an expert after your first class. It will take a few classes for you to feel totally comfortable with the machine, and that’s okay. You might find it helpful to pick a machine in the middle of the room where you can look to other students to see if you’re doing it right. It is also a small class size, so you can rest assured that your instructor will be available to help you with any questions you have. The Lagree Fitness workout is designed to address the five basic elements of physical fitness: strength, cardio, endurance, flexibility, and body composition. It builds slow-twitch muscle fibers, which burn fat and are smaller, which contribute to a toned, lean look. Throughout the workout, you will focus on one muscle group at a time, generally starting with the core, then lower body, then upper body. Usually, lower body exercises are done for a minute or two and compose half of the class time. The idea is to keep your movements slow and steady to focus on the slow-twitch muscle fibers, and to not concern yourself with doing more reps. Transitions between exercises are meant to be quick; there are no breaks in this workout! Fortunately, this is a low-impact workout, meaning that your joints will get a break, but your muscles certainly won’t. It’s typical for your body to shake throughout the workout, which just tells us that your muscles are working overtime! This tends to be more common with lower body exercises as you also have to work on balance. Keep in mind that while it’s normal to feel uncomfortable (after all, workouts shouldn’t be too comfortable! ), you shouldn’t be in pain. If you experience pain during the workout, talk to your instructor. After the class, most people say that they feel incredible! Chances are, you’ll feel sore, especially if you don’t tend to do workouts that focus on slow-twitch muscle fibers. While you may start only doing it once or twice a week, we find that after a few weeks, you get totally addicted and can’t wait to come back! Inspire Seattle would love to introduce you to the power of the Megaformer workout! Schedule your first class today!